On Friday, May 22nd the new nautical pole in Torre Annunziata, a modern production area spread over 125.000 sm, opened to selected guests on the occasion of a unique event: sea trials and test drive so to taste the sportmanship and the elegance featuring Apreamare and Itama brands. Tradition and history, technological innovation and advanced research on materials, but also performance and great care in construction details feature the DNA of Itama, Porsche and Apreamare, able to arranged an original and involving event Itama, an icon in Italian open yachting, praised especially in the 70s by the international jet set who made Itama yachts an item of worship, had available for sea trials and visit onboard Itama Forty and Itama Fiftyfive, models which made the success of the yard after the entrance in Ferretti Group (2004). The guests lived the filters free contact with the sea that Itama boats can give at best. Apart the flagship – Itama Seventyfive – was available too, after having gained a worldwide success thanks to its ability to boast style and power, two of the main feature of this brand. Apreamare, other Ferretti brand, is a long tradition company, who renewed the gozzos, maintaining the distinctive feature of craftmade care, and, at the same time, providing them with the most advanced technological innovations. Also Apreamare gozzo and Maestro complete ranges have been presented in the nautical centre marina, ready for visits onboard and sea trials. Finally the Porsche dealer for Naples Palumbo introduced in this special setting the new Boxster and Cayman, available for exciting test drive, with the support of professional pilots coming from Porsche Driving School. Passion, power and sportmanship feature those brands, who maintain the leadership in each market mixing attention to beautiful design and advanced technological innovation. The Bordeaux Commercial Court has authorised the sale of Couach to Industrialist Fabrice Vial for €1.5 million. Vial, who is the owner of a 33 metre Couach yacht intends to continue the yacht builder’s present strategy and will focus mainly on yachts of 50 metres. He expects to retain all 310 workers, although it is uncertain when work will restart at the yard, which has remained closed since March. Ferretti group, a world leader within the sphere of the design, construction and sale of luxury motoryachts, encompassing a unique portfolio of nine of the most exclusive brands in the nautical world, wishes to announce a new, prestigious undertaking: “Easea>show”, a permanent exhibition of the group’s top yachts on show at Cattolica marina starting from 12th June 2009. Devised to further enhance the excellent range of services devoted to its owners, “Easea>show” will be an exclusive, personalised showcase of the Ferretti Yachts, Pershing, Itama, Mochi Craft and Custom Line fleets, and, starting from Autumn 2009, involve all the other Ferretti group brands, too. The exhibition, part of the larger “Easea>yachting” service project, will be a true private “boat show”, enabling even the busiest customers to visit yachts any day of the year, and test them in the water in total privacy and relaxation. 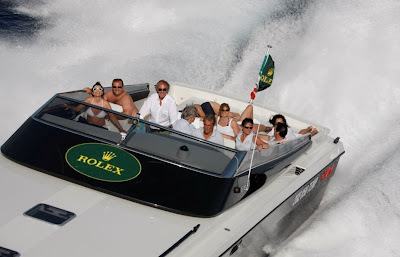 “Easea>show” thus responds to the requirements of the most demanding owners who, by booking through the reference dealer for their area, will be able to visit and carry out sea tests accompanied by a highly specialised member of staff, thereby avoiding the inconvenience of overcrowded boat shows. Moreover, “Easea>show” will enable owners to admire and visit top Ferretti group yachts, completely fitted out with exceptional furnishings produced by the most important luxury designers: Christofle, Frette, Oluce, Pentalight and Somma to enrich the elegance of the Ferretti Yachts and Ferretti Custom Line interiors with their fabrics and furnishing elements; GT Design for the textiles and fabrics on board the Mochi Craft range; Christofle a Radaelli, Fos, Gentili Mosconi and Pineider for Pershing. The “Easea>show” experience will be yet further enriched through top partnerships with prestigious facilities in the area, such as exclusive hotels and restaurants, well being centres and “special shopping tours”, which will make an owner’s visit even more special. The exhibition, initially comprising top Ferretti Yachts, Pershing, Itama, Mochi Craft and Custom Line models, will be extended to the entire range of Ferretti group brands by the end of the autumn boat shows. This will complete an undertaking which had never before been developed on the world nautical scene, and offer Group clients the privilege of being involved in a unique, “tailor-made” experience. Nautilux, the Adriatic coast dealer for Fountain Worldwide in Italy, has organized the Challenge of the Summer. Marco Paci and Team Nautilux will run a Fountain 34 CC Sport Fish from Porto San Giorgio, a seaside resort and port city nearby San Benedetto del Tronto, one of the stops for the Powerboat P1 World Championship, 170 miles north to Chioggia, a small fishing village at the southern tip of the Venetian Lagoon, near the famous floating city of Venice. What is so special about that? Well at the same time as the Fountain 34 CC Sport Fish jumps on plane and blasts its way to Venice, a brand new Citroen C5 (a sporty sedan) driven by nearby dealer Boldrin Auto, will take off by road to the same destination to see if they can beat team Nautilux and the Fountain. Via Michelin, the Italian equivalent of Map quest, clocks the car journey at 4 hours-that's abiding by all the speed limits and stop signs. Sure! They're Italian! Calculating an average speed of the Fountain at just around 50 mph, Team Nautilux should make the journey in 3 hours and 20 minutes. Of course, they don't have speed limits or stop signs, but at this time of the year, the Adriatic is known for rough seas. The head-to-head or should we say Mano-e-Mano, took place on Saturday may 30th. Otam was support boat of the Giraglia Rolex Cup in Saint Tropez from the 14th to the 16th June. Otam 45 Heritage HS the smallest yacht of the line was the protagonists of the Giraglia Rolex cup last weekend in Saint Tropez. Its crew lived the competition in fist class and all its emotions since the last straw. Otam, experienced the sea as a protagonist in Saint Tropez. Menorquin continues to advance by improving and expanding its range of services to adapt it self to the changing market needs. In order to achieve this the Balearic shipyard has developed a very wide spectrum of services which include every type of repair work facility, restoration and boat maintenance service; all orientated to provide personalized solutions according to each customer’s needs. Menorquin Services is available for any boat type and the services are offered along the whole Menorcan coast, the island being a strategic passing point in any Mediterranean crossing. For those whose home port is on the island it offers the opportunity to renovate, repair or fine tune their vessel; but it has also been put in place for those sailors cruising around the Balearic Islands wishing to freshen up their boat whilst they spend a few days visiting some of the islands many attractions. Menorquin Services may also be contracted through Menorquin’s distribution division, called Emotion Yachting, which has its headquarters in Denia (Alicante). The Shipyard has 30.000 m2 of facilities on Menorca for carrying out the various tasks which make up the Menorquin Services programme, including buildings for hull lamination work, paint spray chambers, carpentry sections, sections for the assembly processes and finishes as well as an area for winterizing vessels, all of these are operated by a team of highly qualified professionals. These facilities enable Menorquin to be efficient in providing high quality solutions for customers and the shipyard also has moorings in Mahón harbour which are available for customers contracting Menorquin Services. Mustang Marine has announced it will be manufacturing it’s soon to be released Australian designed Sports Cruiser range in Asia to meet the demand for good quality entry level boating in Australia. The new Sports Cruiser range which includes the 2850, 3350 and 3850 will be manufactured by Mustang's production partner in the Philippines, Australasian Marine Alliance Corp. Sports Cruisers destined for Asian markets will be fully built at the production facility in the Philippines reducing shipping costs and improving lead times, however boats sold via Mustangs Australian and New Zealand dealer network will be assembled to a partial stage in the Philippines and completed in the Mustang facility on the Gold Coast. Australasian Marine Alliance Corp has recently released the first test production Sports Cruiser. Mustang CEO, Chris Heaton, was on hand to review Mustang's strict quality requirements and was thoroughly impressed with the fit out, finish and overall attention to detail. Mustang have an absolute focus on delivering quality products at a great price, Mr Heaton went on to say. Strict quality assurances have been put in place, and will be monitored to ensure the highest quality is always maintained. Mustang has committed to building the Australian designed Sports Coupé, Sports Euro and Sports Flybridge ranges at their production facility on the Gold Coast, Australia, where they now maintain a growing workforce of well over 100 people. The 2850 will be the first Sports Cruiser to be released in December and will reflect the new European inspired styling, exceptional quality and performance that Mustang features across their entire range. Nordic Tugs, a US manufacturer of tug-style trawler yachts, has appointed Andy Lund as the company's new CEO. Lund owned one of the largest Grand Banks dealerships in the US from 1995-2001 and served on the NW Yacht Brokers Association board of directors for five years. An avid boater, he sold his Grand Banks dealership in 2001 and has spent the past few years cruising from the Puget Sound through the Panama Canal, across the Atlantic and around Europe on a long-range trawler. Headquartered in Burlington, Washington, Nordic Tugs builds classic tug-style cruisers from 9.8m-16.5m (32ft-54ft). Late last year, Nordic CFO David Goehring was appointed president following the death of former president/CEO Jim Cress in October 2008. Goehring will continue to serve the company as vice president and CFO. During the World Championship qualifying match played in Gothenburg, the Swedish National Football team was looking for a pre-game experience to relax before the important match against Malta. The decision to visit the Nord West boat yard on Orust became an easy choice as many of the players share the passion of the boating life. The players and leaders were given a tour of the factory to see the production up close and were also given a chance to sea trial the many different models and the different drive systems. Especially exciting was driving with the IPS systems joystick function on the new Sport cruiser. The National Football team secretary Leif Andersson, gave the a big following greeting to Nord West saying it was very interesting and exciting experience for the entire crew. Perhaps the future will see some of the players cruising around in a new Nord West boat. Turkish motoryacht producer Numarine is to hold its second Open Day in Bodrum next month. From July 2-4, members of the press and distributors will gather to see the launch of the company's latest model, the 78HT, which is making its world debut. Sea trials will also take place onboard the 78' Fly and the 102' RPH. Founded in 2002, Numarine of Gebze, Turkey has a production capacity of 50 yachts per year, ranging from 55ft-102ft (17m-31m) in length. Pershing, a brand of Ferretti S.p.A., world leader in designing, building and marketing luxury motoryachts, enters the very heart of the nautical season with the exclusive Pershing SeaShow 2009. An event created to promote the brand’s innovative corporate philosophy, the SeaShow has been realized from the 12th to 14th June, in the extraordinary setting of Cattolica Marina. SeaShow 2009 is an appointment devoted to all lovers of the shipyard’s unmistakable style. It provides a special opportunity for them to share unique moments on board a Pershing, and directly experience the sportsmanship and elegant style of these yachts. The most important models of the fleet have been at visitors’ disposal for exciting sea trials for the entire duration of SeaShow. Every day, from 10 a.m. to 7 p.m., Pershing have offered guests the chance to visit the yachts and experience their high performance at sea. Several jewels of the sea, ranging from 46 to 90 feet, have been on display, including the high performance of Pershing 90’, featuring the characteristics and distinctiveness of a true megayacht; Pershing 80’, the shipyard’s very latest model and winner of the “Best Luxury Performance Yacht 2009” award on the Chinese market; and Pershing 56’, Pershing 50’ and Pershing 46’, with their racy, sporty lines. Visitors have also been able to admire Pershing 64’ and Pershing 72’, symbols of design, functional innovation and high, on-board technology. For over twenty years, Pershing has been an all-Italian symbol of comfort, technological innovation and cutting-edge design worldwide. The shipyard has provided guests with an opportunity to fully-experience the power, speed and innovation has always distinguished its yachts. Everything has been realized for an exclusive event which has opened the nautical season and has attracted the most enthusiastic lovers of a top performance at sea. Princess Yachts International has signed the lease for a 15 acre (6 hectare) waterfront site at South Yard, Plymouth. Part of the famous Devonport Naval base, this facility has been acquired to enable Princess to commence the construction of a new range of large yachts. The bespoke craft, which will be over 100 feet, are too large to be built in Princess’ existing manufacturing sites. With the additional 15 acres at an estimated phased investment cost of around £15m, Princess Yachts International now has over 38 acres of land in Plymouth, including its Newport Street head office and manufacturing site, Coypool, Lee Mill and Langage sites. The company remains one of the largest employers in the area. One of the first yachts to be built at the South Yard site will be the Princess 105. Heralding the start of a new range of technically advanced, long range cruising yachts, it is estimated that the first finished craft will be completed by the end of 2010. The development of these new larger models forms a major part of Princess’ future expansion plans, and has helped secure the future employment of many of its existing staff. Robert had a celebratory glass of champagne at the Technology Centre Meeting Room on Thursday 4th June with a number of retirees who have been with the company for many years. Robert thanked them for all their hard work and wished them a happy and healthy retirement. One of the retirees included Colin Baldwin, who was leaving the company after 12 years. Working in the moulding shop, Colin has witnessed major changes in his time at the company. He's seen the development of the tech centre, Sunseeker's venture into the Superyacht market, the purchase of the 11-acre site at Portland and the brand's elevation to world style icon. Colin's part in the process has been integral - he was a member of the team that has won four Queen's awards over the years. A recent visit to Portland and Weymouth by Her Majesty the Queen and His Royal Highness the Duke of Edinburgh presented Sunseeker International Limited with the opportunity to fly the Royal Standard on one of the company's luxury yachts as it carried the royal couple from the National Sailing Academy to Weymouth Quay. Her Majesty the Queen and Prince Philip were visiting various attractions in the area including the Sailing Academy where Lord Sebastian Coe, chairman of the 2012 Olympic Games organising committee, proudly showed off the first Olympic venue to be ready. Having signed the academy's visitors' book the royal couple were met by Sunseeker representative and ex Royal Yacht Britannia crew member, Peter Langridge, and boarded a Sunseeker 34 Metre Yacht. According to Peter Her Majesty the Queen and Prince Philip were very impressed with the vessel and favourably commented on its design and level of finish. The trip then passed through Portland Harbour, across Weymouth Bay and along Weymouth Quay, ending with the royal couple leaving the yacht at the Harbour Masters office where a large crowd greeted them. Sunseeker International has become a major contributor to the area having acquired an 11 acre site next to the sailing academy at Osprey Quay. Most of the company's larger models are moulded and built at this new facility and with the addition of a 300 tonne travel hoist even larger models are being planned for the future. Colombo now coming from the new management of Sarnico Group, show its future aims with the presentation of the project for the 37 Alldays upcoming model which will also indicate a new range. 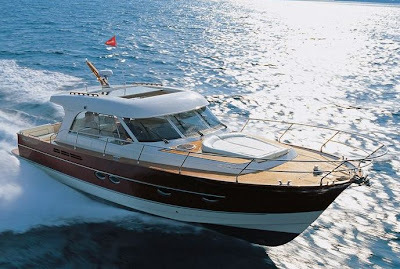 The 37 Alldays is designed by renowned Venice firm Nuvolari Lenard a long collaborator for Sarnico but doing its first job for the renowned classic Como boat builder. As this rendering above shows this new model has features which unite it to Sarnico Yachts like the stern design, others to Colombo thanks to the use of mahogany wood inserts outside, and a new unedited solutions for both builders thanks to the deep walk around side decks. As the model name indicates the 37 Alldays wants also to be an all year to use Sport Cruiser being it rain or sun with a glass hard top closing in seconds, and a patio door aft doing the same for the main deck. Inside it offers a living with galley on the main deck, two cabins offering sleeping accommodation for five persons, and a separate shower head. Power is by twin Volvo IPS400 D4 300hp joystick, offering easy manoeuvrability with joystick and the efficiency of the forward looking double propeller pod drives. Monterey Boats unveiled the third of the company’s 2009 new models all announced during the annual dealer meeting in August, and the cream of the crop was the 2009 320SY Sport Yacht. The 320SY Sport Yacht with a length of over ten metres and a spacious beam, was the larger of Monterey’s new line up and completes the range of eight cruisers ranging from 26 to 41 feet. Featuring European styling and a forward extended arch, this new model raises the bar in style, and is packed with amenities above and below deck, defining luxury and performance. For example dual extra wide seats are situated at the helm for the driver and passenger, and a large fiberglass sliding door with extra sized integrated steps leads to the foredeck easy. If you want more luxury you can also include the optional 16,000 BTU cockpit air, cockpit television, and the Flexiteek inlay for the swim platform. The 320SY Sport Yacht can also be equipped with the industry’s most revolutionary advanced propulsion and navigation systems, including Volvo’s new gas EVC or MerCruiser’s exciting Axius. Edgy, contemporary interior lines and a full fiberglass headliner highlight the style down below. The cabin is rich with luxury and elegance, with Sapele African mahogany wood trim, wood mini blinds, an enclosed fiberglass head and fully appointed galley with sink, designer faucet, dual burner electric stove, coffee maker, microwave and cabinets. The full size vee berth has a quilted mattress cover, privacy curtain and storage underneath, as does the comfortable island berth with luxurious UltraLeather, perfect for overnights or just quick naps between destinations. Completing the vast array of entertainment amenities is a 22 inch flat screen TV. 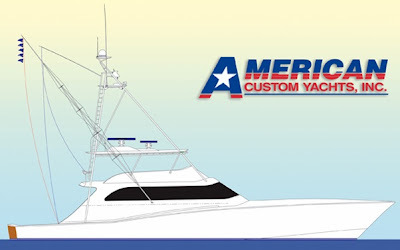 American Custom Yachts construction for its ever biggest built the 90 Freedom is coming closer to completion every day. 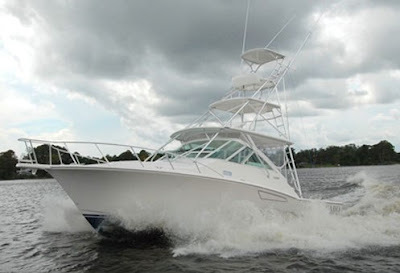 The 90 Freedom is a fast ninety foot Super Sportfish which will literally fly across the water. Construction status is now that the deck house has been removed in preparation for engine installation. Interior accommodations, consisting of six staterooms and five heads, are nearing completion. The bridge, console and cockpit cabinetry have been constructed in modular fashion on the floor. The exhaust system has been engineered and dry fitted and the engine room has been primed and fitted with custom reinforced motor mounts to accommodate the massive MTU 4000 Series power package boasting a whopping total 9,200 hp. The Class 1 World Powerboat Championship will introduce a two-race Grand Prix format for the first time at the Norwegian Grand Prix in Arendal, 17-19 July. The proposal, put forward by IOTA President, He Sheikh Hassan Bin Jabor Al-Thani, was evaluated by the WPPA, receiving their full agreement, and has been unanimously welcomed by the teams. The new format, which has also been warmly welcomed by all of Class 1's Grand Prix Organisers, will see first official practice taking place as usual on the Friday, with an extended one-and-a-half hour session on Saturday morning for practice and qualifying in the Edox Pole Position, with no limit to the number of timed laps, followed by Race 1 in the afternoon, made up of approximately 12 laps including one long lap, with a maximum time limit of 35 minutes. A third practice session on Sunday morning will be followed by Race 2 in the afternoon - with the starting line-up determined by the results of Race 1 - of approximately 15 laps, including one long lap and a maximum time limit of 45 minutes - with both races counting for full championship points. Italian motor and super yacht builder Canados presents its latest new model the 76. A waited debut from the naval builders of Ostia, which is the sea side resort to Italian capital city Rome. This new 76 replaces models 72 and 80. Spaciousness, and a bigger ship like built feeling has always been the order of the day since the founding of this builder in the nineteen fifties. Distinctive feature for the 76 is surely the elegant single big side window on the main deck, which fills the split level saloon with natural light and giving an elegant traditional classic modern look. The 76 offers a standard traditional four cabin lower deck layout, with central located owners cabin, VIP cabin to fore, two double cabins in between. Crew berths for three in two cabins with a single head, and direct engine room access is located aft. Performance is a top speed of 31 knots with twin MAN or Cat engine choices of the same 1550hp. Cruising is 27 knots giving a range of 380 nautical miles. Absolute Yachts announce there latest project model the new and innovative 64. The new 64 epitomises what Absolute have become famous for, stunning modern looks, innovative design, exceptional performance and interior design that maximises usable space. Not only have Absolute created a stunning yacht but they have followed up on the ground breaking electronic control centre of the recently launched 70, and further enhanced it as a fully integrated yacht management system. The helm station is furnished with no less than three large LCD touch screens which operate every system on the yacht. Everything from navigation to Audio Visual systems, engine management, lighting control, tanks, CCTV, climate control and safety systems. There are literally no switches at the helm station, all commands are through the various touch screen and each system can be controlled from any of the three screens at any one time. There is of course plenty of manual redundancy built in should any screen or software program fail. The advantage to owner operator of the new system is that is extremely intuitive, easy to understand and much quicker to operate the various functions that the yacht offers. It is much safer too as each screen is a large viewing platform for all the systems on board rather than a battery of dials, switches and small screens. Absolute with the new 64 continue there following to the Volvo pod drives, powering this new model by four IPS600 engines giving a maximum speed of 34 knots and a very economical 25 knots cruise. As its known IPS offers many benefits along with greater internal volume, in this case used for a bigger master full beam stateroom which Absolute say is the equivalent in size to that of a 70 feet plus yacht. The 64 also has provision for a 320 jet rib in a tender garage under the cockpit and a further facility for another jet bike or RIB on the swim platform. There is also a fully retractable glass roof over the saloon with a second retractable sunroof over the cockpit allowing a fully shaded area, or for the sun worshiper can been retracted to give a fully open area to the sun. Forward of the saloon on the outer deck there is a forward lounging area with seating and a forward table with fold out parasol giving a second outside leisure area away from the stern of the yacht. The saloon and aft cockpit have been designed as a one living entertaining space if required, with the floor here being all on one level throughout and the patio folding doors retracting fully either side of the cockpit allowing free movement between one area and the other. There is also a full size crew cabin aft which is accessed through the cockpit. Absolute have also given great thought to increasing the deck stowage on board with more lockers and stowage bins forward as well in the cockpit. Special thanks to Ocean Nautic boss Mr. Trevor White, Absolute United Kingdom dealer for this Exclusive preview. Jim Sculley, founder of Sculley Boatbuilders, passed away unexpectedly on June 1, 2009. His presence will be keenly missed within the sportfishing community. Jim is survived by his loving wife of 47 years, Ingrid Sculley, son, James G. Sculley, daughter, Ingrid Diane Sculley, and grandson, James Crespo. Born in Newport Beach, California on May 30, 1941, he was residing in Ft. Myers, Florida but with lasting ties to Virginia Beach and Wanchese on the Outer Banks of North Carolina. Native to southern California, he grew up fishing alongside his father on their commercial boat. It was there he had his first encounters with the new sportfish boats and as a kid he dreamed that someday, maybe he can have one of those. After much success in the restaurant business, he was in Hilton Head, SC he befriended and fished with Virginia Beach native Captain Earl Richardson. It was this friendship that brought Jim to Virginia Beach to purchase Fisherman’s Wharf Marina and the Riverhouse Restaurant on Rudee Inlet in 1990. Jim quickly became a fixture in the local offshore fishing community and quietly made a deep and lasting impression on many. During his years at the marina, he owned and operated a variety of sportfish, garnering a broad knowledge and experience of the best and the worst the industry had to offer. Taking that a few steps further, he started Sculley Boatbuilders in 1999, integrating his years of offshore experience with a vision of the best attributes of production and custom builds combined. Thanks to his vision, ten years later Sculley Boatbuilders continues to produce one of the finest sportfishing yachts on the water. Jim’s passion was tournament fishing, and he was at the helm whether it was a low-key home tournament or the ESPN2 Xtreme Release Billfishing Series. In addition to top honors in the 2004 Xtreme Release Series, Team Sculley won and placed in several other East Coast tournaments over the years. But a day offshore, fishing with Sculley was a treat regardless, and always memorable. He will be remembered for it all and missed deeply. Astondoa presents the 55 Open Cruiser, a new model based on the development of the 53 Open. The noticeable difference for the new 55 Open Cruiser from the 53 Open are the patio door aft separating inside from outside, and the aft deck, now featuring a settee versus the sunbed. The 55 Open Cruiser also features an expendable hardtop sun shield to protect the aft deck, and the saloon view windows are now made of an integrated glue window with one vertical port hole to open up for the air. Opening the three piece patio door one also finds the most major difference with the upper saloon now fitted in more luxury with oak and wenge wood, and a leather saloon. Inside the three double cabins layout is kept with the owners cabin to fore, spacious VIP cabin to starboard, and a third bunk cabin to port. Performance with the standard twin MAN R6 800hp each is a 35 knots max and a 26 knots cruising which give an estimated range of 400 nautical miles. Galeon present a new version for the new flagship the 700 Raptor, presenting the project for the 700 Raptor Sky Deck. The 700 Raptor Sky Deck is based fully on the hard top sport yacht of the original model, but adding to it a flybridge on top for extra driving enjoyment with sun and wind on your face. The Sky Deck flybridge will feature a central single seated helm station, and two l-shaped settees on the sides. This extra space up top does not disturb the clean lines of the original version and is hardly noticeable from the outside with the only difference to the naked eye being a more pronounced radar arch. Inside the Raptor Sky Deck also follows the theme of the original version with huge windows for unedited views, natural light, and the aft patio door which fully retracts to join the aft deck with the interior saloon. Performance for the 700 Raptor Sky Deck should also be similar to the standard version with Galeon estimating a top 36 knots speed on the Tony Castro designed hull with twin MAN V12 1500hp. Custom Delaware Sportfish Yacht builder F & S Boatworks delivered its biggest built to date, the 72 hull 12 which goes two feet further to the previous bigger model. While many would think this is an extension to the seventy footer hull eleven, technical indications as the wider beam of three inches, and a shallower draft of seven inches say this is a completely new hull studied on purpose. The new Jim Floyd creation is also about massive speeds with prediction for a 44 knots max, although the first sea trial with near to full load did do 42.5, but also gave an economic 30 knots cruise. Along the variable vee stepped hull shape the new 72 flagship also gives another novelty with the use of Sea Torque shaft system, which also adds about 10% of more performance along with added safety. F and S where so much impressed by the innovative shaft system by Sea Torque fully enclosed oil bathed with the big universal joint that Floyd said he will never built a boat without them after this. Hull number twelve was eighteen months in the making and a sister 72 hull fourteen, to what similar a fully custom built may be is already in the making and predicted for launching in 2010. 10 Cigarette Smash Poker and 43 Ikocasa have been declared as the Turkish Grand Prix of the Sea winners in the SuperSport and Evolution classes respectively. The all-female crew of Shelley Jory and Audrien Ciantar in the Chaudron hull followed Saturday success in the Sprint race by claiming the Turkish Grand Prix of the Sea title in SuperSport. Cigarette Smash Poker's victory in Sunday's Endurance race helped the Italian team of Luca Formilli Fendi and Matteo Nicolini take the Turkish Grand Prix of the Sea in the Evolution class by one point from rivals 33 Furnibo. 77 Lucas Oil Outerlimits and 26 Team SW1 Capital took pole position, in the Evolution and SuperSport classes respectively, for the Turkish Grand Prix of the Sea in Istanbul. Charging head-on into the ferocious Bosphorus current, Lucas Oil Outerlimits pipped the Cigarette Smash Poker hull by less than a second, powering their Chief engine up to speeds of 110mph to guarantee prime positioning for Saturday’s Sprint Race. Clocking a total time of 2:07,77 for their two laps, Lucas Oil Outerlimits pilot Nigel Hook was understandably delighted with the boats performance, erasing the disappointments of the Maltese Grand Prix of the Sea, where the American team’s boat was filling up with water towards the end of the Endurance Race. Equally as satisfied with their efforts after displeasing late drama in Valletta, Team SW1 Capital duo, Kim Collins and Dan Cramphorn, who snuck home in 2:41,01, were very pleased with their start to the Turkish Grand Prix of the Sea. Finishing a mere 0.18 seconds ahead of Baia Attolini (2;41.19) in second and with only two seconds separating the top five teams in a closely fought SuperSport class Power Pole. 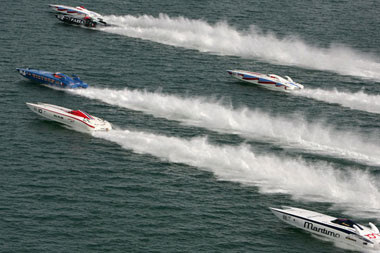 77 Lucas Oil Outerlimits emerged victorious at the Sprint race at the Turkish Grand Prix of the Sea. Driver Joe Sgro and throttleman Mike Fiore were forced to draw upon their countless years of powerboating experience to see off the brave challenge of the Belgian 33 Furnibo, who had threatened a major shock midway through the 10-lap race. A broken sensor prevented the 53 Metamarine Pignolo 53 from starting the race while previous championship leaders 88 SNAV OSG were forced to retire during the first lap when the belt powering the superchargers snapped. It was at the front where excitement levels peaked as the Furnibo hull, comprising of Pierre Colpin and Frank Hemelaer came within a boat length of Lucas Oil Outerlimits. The assault on Messrs Fiore and Sgro ignited the Americans into action, eventually pulling away from the 2009 debutants. Upon taking the chequered flag, Lucas Oil Outerlimits secured the maximum 100 points on offer, moving them to the top of the world championship standings in the Evolution class. 10 Cigarette Smash Poker re-ignited their Evolution championship ambitions after a comprehensive win in Sunday's Endurance race in Istanbul. The Italian duo of Luca Formilli Fendi and Matteo Nicolini led the 16-lap, 73-nautical mile race from start to finish to move them into second place in the overall championship standings above Lucas Oil Outerlimits. Pre-weekend leaders 88 SNAV OSG again failed to register a point as the boat remained in the wet pits after their mechanics were unable to repair the damage caused in Saturday's Sprint race. To cap a miserable day for the Outerlimits boats, 77 Lucas Oil Outerlimits dropped off the pace when well-placed in second with an engine problem. Agonisingly for the American team of Joe Sgro and Nigel Hook, the boat was 100 yards from taking crucial championship points. The 33 Furnibo hull once again impressed with a second runners-up place, just under two minutes ahead of the 53 Metamarine Pignolo 53. Indeed, it was the first time Max Ferrari and Marco Pennesi completed a lap this year. Silverline's fourth position was enough to see the Buzzi boat take over as the fourth different leader in four rounds in the Evolution class standings. Shelley Jory and Audrien Ciantar became the first all-female winners in Powerboat P1 history after stealing victory in Saturday’s SuperSport Sprint Race at the Turkish Grand Prix of the Sea in Istanbul. Racing the Chaudron-manufactured 44 Iko Casa hull, Powerboat P1’s first-ever ladies team triumphed at the expense of SuperSport World Champions, Angelo Tedeschi and Aaron Ciantar, following the 43 Seagull Chaudron team’s agonising last-lap overspeeding penalty, which saw them drop from first to fourth in the race standings. Championship rivals 38 Baia Attolini were promoted to runners-up with Belgian boat 17 Masforce celebrating their first podium of the season. However, Friday’s PowerPole pacesetters, 26 Team SW1 Capital, suffered a third-lap retirement after a drive shaft snapped. Team SW1 Capital wrote their own fairytale story in Istanbul on Sunday with victory in the SuperSport Class Endurance Race at the Turkish Grand Prix of the Sea. Having crawled back to the dry pits after snapping a shaft during Saturday’s Sprint Race, Team SW1 Capital staged a miraculous 24-hour turnaround with driver Dan Cramphorn’s brother, Jamie, flying out the necessary spare part from London via Taunton, Somerset to Istanbul in time for emergency overnight repairs. A far happier throttleman, Kim Collins said the Team SW1 Capital duo must be either braver or more stupid than their rivals after romping home by a margin of 44 seconds. Cantieri Navali Cerri presents the much waited 102 Flyingsport, new flagship for the Tuscany Massa located builder. Natural design evolution on the looks department of the previous bigger model the successful 86 Flying Sport, the new flagship has been three years in the making and continues Cerri shipyard aim in building larger Super Sport Yachts. The 102 Flyingsport also follows Cerri's two important visions of innovation and personalization, both of which play an important element since the first model of a 28 feet sport cruiser was introduced in 1997, and taken to higher extremes when in 2004 the first 86 Flying Sport was delivered, proving a great success with the so far delivered eleven models. The new 102 flagship follows the concept of the previous bigger model, and as is the case for Cerri's smaller boats it is a tailor made built, with the only thing similar to the sister ships being the outside, and even here it is possible for some modifications as the buyer desires. The interior for the 102 Flyingsport shows it also to be among the most spacious yachts in its size and type, with five double guest cabins, all of impressive spaces and adding to this also a lower deck saloon. Other important notes are the performance with twin MTU 2400hp engines and Arneson Surface Drives ASD16L propulsion giving a max speed of 40 knots, and a continuous cruising of 36 knots. 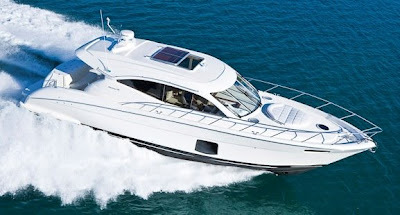 The innovative features which gave the 86 Flying Sport it success, are also repeated here like the second sporty do not disturb the line please flybridge helm, the forward deck entertaining area, and the upper saloon divided between dining and relaxing areas all in luxurious comfort. Yes these features have been copied by the competition but the customization of Cerri is something unique, and if you want prove just contact the shipyard and they will show you all the 86 Flying Sport models delivered which have all been different to the other. Responding to the market interest in mid-size auxiliary sailboats and small displacement powerboats, Westerbeke has just introduced a new 68hp (50.7 kW) diesel engine, the Westerbeke 65A Four. This 4-cylinder, 3.3 liter, naturally-aspirated diesel runs at 2600-rpm yet produces a very impressive 163 lb/ft of torque at only 1400-rpm! Torque is the attribute of marine engines which most influences their ability to push non planing boats through water. Low engine speed also contributes to quiet operation, less vibration for more pleasant powering, and efficient use of fuel. It also reduces stress on engines, thus contributing to a longer service life. Westerbeke is renowned for all of these attributes and has received numerous awards for marine power innovations. The 65A Four is now in production and offered with standard 72 amp battery charging alternator, EZ-bleed fuel system, transmission oil cooler, fresh water lube oil cooler, over sized marine transmission with 1.88:1 reduction, domestic hot water connection, coolant recovery tank as well as low oil pressure and high coolant temperature alarms. Riviera, presents its next project the new 5000 Sport Yacht set to launch at the Sydney International Boat Show at the beginning of August. Powered by twin Cummins Mercruiser turbo diesel engines linked to the revolutionary Zeus pod drives, this new model builds on the extraordinary success of the Riviera 4700 Sport Yacht that won the AMIF Boat of the Year award in 2007. As well as the new propulsion system, the 5000 Sport Yacht is offered with an unprecedented range of options that will allow owners to configure the boat to their individual boating requirements. The new propulsion system offers easy manoeuvring in close quarters such as marinas as well as overall performance. Cummins Mercruiser Diesel claims up to 30 percent improved fuel economy as well as 15 percent faster cruise and top speeds over conventional drive units. 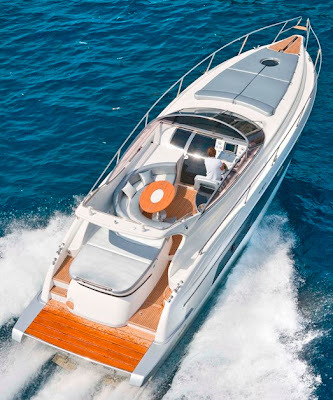 The 5000SY is the fifth member of Riviera’s European-style Sport Yacht family and replaces the shaft drive 4700SY. The elegant 5000SY maintains and expands on the single-level lifestyle design of the Riviera Sport Yacht line, including an aft galley and stainless steel pillar less aft bulkhead door and fold-up awning window that open the saloon right out into the cockpit. The underwater profile of the Riviera 5000 Sport Yacht includes two Zeus drive units with aft-facing counter-rotating propellers and underwater exhausts mounted in tunnels that protect the pod drives from underwater debris. An advanced joystick control system for slow-speed manoeuvring can be operated with one hand and a single turn of the wrist; from sideways tracking to spinning on a pin, to precise speed control. Zeus also features Skyhook, a system that will maintain the vessel on a fixed heading within a tight area, even in strong currents and windy conditions. Continuing Riviera’s commitment to innovation, the 5000 Sport Yacht offers owners a range of options including two accommodation layouts and optional cockpit furniture. The accommodation options are the choice of three cabin and two bathroom design or two cabins and two bathrooms plus a below-deck lounge area. In the cockpit, owners can choose between a standard layout of a single long lounge across the transom with a long hi/low table or the option of an additional L-shaped aft-facing lounge in the forward quarter with a table, deleting the long table. Expansive panoramic windows and a huge electric sunroof in the saloon enhance the relaxed, refreshing and airy ambiance of this new model. Saturday, June 13 Paragon Yachts debuted the 31, latest new model from the Finnish boat builder which is part of Nimbus Group, The Paragon 31 made her official debut during the Volvo Ocean Race in Stockholm. During the race stop it served as official VRC Security Boat and was also moored and displayed at Skeppsbron. The boat is the second model in a generation of year round boats that build on the successful Paragon 25 concept. The Paragon 31 has good storage and a plan that provides spacious areas with room for the entire family and activities at sea. Paragon's philosophy, which was developed by Sakari Mattila, is based on a careful preliminary study, collaboration and development together with Search and Rescue, the Coast Guard, racers and professionals who work in demanding environments at sea. The boat has a pronounced v-hull, which provides great stability while maneuvering at high speeds and keeps fuel consumption down to about 1.8 liters per nautical mile with the D6-370 engine option. Maximum speed is about 38 knots. The 31 being the second model from Paragon follows the philosophy of the first model, being a boat for discerning owners and taking challenging conditions with pride and safety. After 5 weeks since the start of the season in Malta, the Powerboat P1 circus gets into its second 2009 round the coming weekend in the cross cultured Asian European Istanbul, Turkey. Its been a long time coming for the teams especially those showing leading potential. The others who had a disappointing start surely have appreciated this break, and will hope to manage the right set up in order to achieve important points to fight for the title and worry the front runners. In Evolution 10 Cigarette Smash Poker after doing some testing and modifications will want to show its super speed seen in both races in Malta, with only a spin and water ingress in the engine room during the second race managing to stop what appeared as the fastest boat during racing. Championship leaders Outerlimits boats, 88 SNAV OSG followed by the 77 Lucas Oil will surely have other plans for this. There is also two much expected showings. The first is the second placed from the 2008 season and only diesel boat for this year, 53 Metamarine Pignolo who after a crash during sea trials in Malta is set to prove itself. The rumours where that the time for pole for the 53 boat was four seconds better then the best registered. The other waited return is a Fountain boat 33 Furnibo, with this legendary US builder already taking two P1 Evolution titles in 2007 and 2008. This new Fountain boat is actually a bit longer versus the double title winner and will also have bigger engines with a stern drive set up. Both 47 Silverline, and 66 Cranefields Wine will surely be looking for that extra speed to worry the front runners too. Supersport Class did return to a competitive edge in Malta. The 43 Seagull Chaudron which is the 2007 and 2008 title winning squad, have been well informed in the first race that 2009 will not be as easy as it was last year, but thanks to a new boat with more powerful Ilmor engines package they still seem to be the favorites. There is two teams who will have a big say for this, both a Donzi 38 boat. One is the 38 Baia Attolini, and the other is new 26 Team SW1 Capital. Both Donzis did finish first in Malta but where put back due to over speeding. The all female 44 Iko Casa, which is the 41 Chaudron 2007 and 2008 Supersport Class winning boat also showed great potential and I am sure this boat still has winning ways in its fiberglass. More to prove for the two boat Italian squad with 28 Blue Shaft and 22 Big Sergio, wanting more speed and in search of more reliability too. The 17 Mas Force will also look for that extra edge in speed to start worrying the front runners and manage to get a podium. Pantera introduces the new 28 SR a modified special version for its much appreciated 28 model launched for its 30Th anniversary. The Pantera 28 SR will feature a full set of novelties in every area of the boat like a newly designed twin stepped bottom design, cockpit dashes, cabin layout, recessed hull sides, headers dumping out the hull sides, and a few other changes. Interior as expected for a fast boat is a spartan yet comfortable to sleep four persons in the vee shaped to fore and two settees. Power is from a single 525hp Mercruiser. Presenting itself in the mid nineties, Princesses open and hard top V series models has been a non stop growing success for the British builder. The V53 presented in the year 2006 has been another winner for the range offering with it a good performance together with a luxurious interior and sleek exteriors but always keeping the conservative Princess look to the overall package. The V53 is an integrated hardtop only model, with a sunroof opening in a few seconds to the sun or closing for the shade or rain protection. The accommodation for the Princess V53 is all about spacious spaces giving in all this more then one would imagine in a sixteen metre size. What you will like and not find on other open hard top boats is the c-shaped settee to fore port side on the cockpit deck. Other valid points is the spacious saloon settee with galley opposite feeling ultra large. The aft deck welcomes you on board with a spacious sun lounger, housing under it a well sized tender garage. Going more to fore you find a spacious c-shaped settee, with wet bar opposite, the unusual but much appreciated six person c-shaped settee to port, and a dual seated helm station to starboard. Below deck is the three double cabins along with the galley and saloon. An area which is very spacious is surely the galley and saloon. The three cabins have all a different plan and layout, with the smaller third bunk cabin disappointing a few viewers but still feeling more spacious to what it actually is. The cabins are located in this manner, double owners with en suite to fore, twin single berth to starboard midships, third cabin with bunks to port, and a guest or day head. The engine options for the V53 are all Volvo D12 engines starting from smaller 675hp, more performing 715hp units, and the bigger D12-800 775hp. The 675hp should give a max of 33 knots, 715hp gets you to 35 knots, and the bigger engine choice gives you a wide open throttle of 37 knots. Princess continue with the tried and tested Bernard Olenski modified vee hull, now used for over two decades by the British builder. Olenski's hull are all about a deep vee entrance forward section and a moderate dead rise aft of eighteen degrees. Princess also used moulded tunnel propellers for reduced shaft angle and cleaner propeller water stream. Propeller pockets give a performance advantage over traditional shaft method although a perfect engine position and weight distribution is also important in order not to have the effect of a high bow ride with a lot of dragging aft. Hard top boats have been in huge demand in recent years, with the market responding fiercely to this with various proposals. While this trend was started first from the Italian builders it is fair to say that is now an international affair. Criteria for the competitors was based on sixteen metres of LOA, three cabins, integrated hard top, open deck no patio door, and traditional in line shaft propulsion or pod drives. Since the eighties Princess have always given attention to open type Sport Cruisers, but somehow the Riviera series always left them behind versus the other British builders. 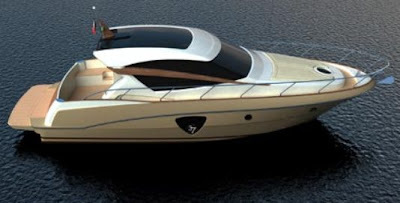 Come the nineties and the integrated windshield V series Princesses manages the unthinkable becoming among the most desired for a British built Mediterranean open type sport yacht. Sitting in the middle of the current ten model V series line up, the V53 is one of the latest designs putting a great looking integrated hard top, with the usual integrity associated with the British marque. Three design solutions set the V53 apart, which are the smaller six person dinning settee on the main deck, spacious galley for the size, and good performance with not so big engines. The Princess V53 also feels bigger to its actual size which is never a bad thing when you are on the water, and everything can start to be seen small. Picture Copyright Princess. Data Princess. Sabre Yachts presents its 52 Flybridge Sedan project, a new version for the as yet 15 boat delivered 52 Saloon Express. This new version is developed to increase market share for Sabre, and is set to launch in early 2010. The 52 Flybridge Sedan differentiates from the Salon Express, is obviously in the flybridge, offering an upper view second helm and entertainment area. The new flybridge will feature a central station with double Stidd helm chairs, a wet bar with drinks fridge, sink with an innovative smart server to the interior galley, and to starboard a comfortable l-shaped settee with table stretching along the length of the bridge. Sabre design department have also taken care for a gentle sloped stainless steel spiral case, and that the stairs to do not disturb much the cockpit versus the much appreciated space of the Saloon Express. Power is from twin Cats C15 at 865hp each. Cabo's 36 Express has been a waited new model from this US California Adelante builder, who with it will replace the 35 Express after over a decade of production. New 36 Express takes elements from its replacement but also from the bigger 38 Express. The lower cabin space is similar to the bigger Cabo 38 missing only the privacy a separation door offers. Below over night accommodation is for five finding sleeping space for three in the diagonal arranged fore part of the cabin and another two in the convertible l-shaped saloon which becomes a double berth. Further comfort below comes from the spacious l-shaped galley, and head to port midships. The hull shape is Cabo modified vee with a medium vee 17.5 degrees deadrise aft similar to the 35 Express. For power one finds seven options from twin Cummins, Cats and Yanmar engines starting from the smaller standard QSB5.9 at 425hp up to C9 Acert 575hp. Propulsion is still the tried and tested traditional in line shaft drive, with Cabo surprising a few peers for not jumping on the pod band wagon for this new model. Another miss I note for this new model is for not offering an enclosed fore cabin, with the closer competitors all having a separate forward master stateroom with a door. Apart all this the Cabo 36 Express does what it is designed to do best having a cockpit and aft deck all planned for the real sport fisher with incredible spaces also thanks to the wide beam. 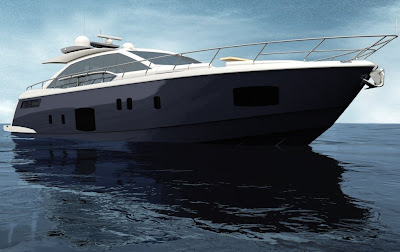 Cantieri di Pisa launches the first example of its new 118 Akhir model. Named Nena the new 118 Akhir is also the first Cantieri di Pisa to ever to feature a metalized grey hull. Launched in Pisa on Saturday 21st February this third model of the generation Akhir is built of fibreglass, and is 36 metres long and has a beam of 7.5 metres. Her dynamic, sleek lines reflect the great Akhir tradition, and are accentuated by two short strip openings above and below the dark hull length band, allowing the creation of nine windows for the owner’s suite. Her interior styling, by Cantieri di Pisa own interior designers, is clean yet traditional with a decorative concept based on the elegance of sanded teak with a wax effect, included in a modern scheme of boiserie that has been given a new interpretation. Here precious fabrics on the wall panels create a warm and hospitable environment, which is blended with a rigorous aesthetic. The furniture is mostly in black pear wood, with large sections upholstered in leather. All the pieces are expertly made using seventeenth century techniques by the yard’s team of skilled craftsmen. Special attention has been paid to on-board lighting with natural daylight filtering through sliding fabric panels, a feature used throughout the yacht in place of more classic curtains. Indirect artificial light is provided by cove lighting, accompanied by direct light points in the shape of designer lamps forming part of the overall furnishing plan. The interior layout also reflects the yard’s skills and creativity with the lower deck configuration including the owner’s suite, a twin guest cabin and two matching VIP suites. The main deck is dominated by the salon that is split into two sections, an area for socialising and a TV lounge. Two symmetrical corridors lead to stairs accessing the bridge and full-beam dining room. Further forward is the crew galley with dinette and a stairway down to the three crew cabins. On the flying bridge, behind the two piloting seats lie a pair of large sunpads, a spacious open area and a kitchen unit aft with a huge C-shaped divan and two large tables that can be joined together. In the cockpit a table, divan and four chairs together with a divan and large sunpad forward complete the range of furnishings. Delivered last March the new 118 Akhir is the third yacht in the new Cantieri di Pisa range, launched in the space of less than nine months and all designed and renewed by architict Carlo Galeazzi. The Nordhavn 63 is yet another development of one of this builders most proven hull forms, the 55. Due to its performance and interior layout capabilities, the 55 has fast become one of the most popular models from Nordhavn, which later was also developed to the new waited 60 foot version to meet owners demands for increased space. This new 63 is actually an aft wheelhouse version of the 60 and its extended cockpit and boat deck. Looks wise, however, the new model retains the same salty feel that popularized the 62. Nordhavn Chief of Design, Jeff Leishman, and his engineering staff continually conceive, design and introduce exciting new models and while the 63 shares the same hull as the 55 and 60, an entire new deck and engine room mold have been created for it, providing increased interior volume and added amenities. The 63 has some important layout changes thanks to the increased length like the center line guest stateroom also featuring four large opening view port lights, and the crew quarters located forward of the engine room cabin. Furnish for the new 63 will be the same paneled cherry wood that was featured on hull number one of the new Expedition Yachtfisher. Power is by the John Deere 6081AFM 330 HP with a ZF ZFW320 transmission with a 4 to 1 reduction gear. The Nordhavn 63 has a projected fuel capacity of 8515 litres which will give a range of about 3,000 NM. French boat builder Arcoa improves its 44 Mystic model with the addition of a new Volvo IPS propulsion option. I think by now everyone knows the benefits of this solution versus the traditional shaft drive, but on the Arcoa 44 Mystic the improvements have beaten all expectations of performance gains. In fact compared with the in line shaft propelled twin Cats C7 Acert 460hp version, the new Volvo IPS600 435 hp option has a big gain of twenty per cent in performance terms. Top speed with this new option is now 37 knots compared to the 31 knots of the C7s, and cruising is 30 knots against the 24 of the shaft option. Presented exclusively in Naples Posillipo bay, Rio's new 46 Art is a further development and replacement for the 44 Art model presented in 2004. The new 46 Art will have three distinctive differences from its replacement model: Volvo IPS pod propulsion in lieu to traditional shafts, bigger full beam owners cabin with large view windows, and lastly a high low bathing platform adding an extra space for a water toy along the all ready existing garage. Performance is equally impressive now with the double IPS600 engines at 435hp each reaching a wide open throttle top speed of 38 knots, and a comfortable cruise at 30 knots. Gianetti 65 Navetta is a waited model from this Viareggio builder who puts its bigger sized semi displacement hull experience to use in a more affordable package. Will be interesting to see how the market reacts to this motor yacht with modern looking topsides, classic hull lines, and the semi displacement hull which allows for a good range with not fast nor slow performance. The interior is a three cabin all with en-suites, with full beam owners cabin located mid ship, VIP cabin to fore, and a two singles guest cabin in between. An extra single guest cabin located midship with en-suite shower head and entrance from the galley can find its place as an extra crew cabin, or utitily room. Taking a lot from classic Italian yachts of the past both the flybridge and aft deck are mostly based on open spaces area, where one can put free standing furniture to his liking. The stair case to the flybridge also surprises being only located inside as is the case for much bigger yachts. Power is from twin Cummins 670hp or the higher rated 715hp units. The Cruiser range from Faeton continues to get upgraded with the project of a new 360 HT, set to launch later on this year. Based on the hull of the first model of the Cruiser line, the 360 Fly, this new HT version follows a more aggressive sport exterior design. There is also a hint of a full beam cabin with the big view windows showing themselves mid ship. Most probably if this is the case I would imagine stern drive or IPS propulsion power for this new sport cruiser with hard top model, unlike the shafts used for the Fly version. So far little information is offered from Faeton, but as was the case for the 360 Fly, one can see again the influence of new owners Astondoa, again in this second new model since there take over about a year ago. To further add to its ground breaking Sports Cabriolet range, Maritimo presents the C50 new addition and third model for this range. Like its siblings the C55 and C60, the C50 is also a single-level coupe sport yacht boat with luxury and performance. The C50 offers an interior with three cabins. Owner’s stateroom to port with its own private en suite, a VIP double forward which will have private access to the second bathroom and a further twin cabin to starboard. The saloon which is on the main deck features a U-shaped settee with table for dining or entertaining and a cocktail cabinet aft on the port side. The galley located to starboard has all the conveniences with a fridge and freezer, microwave, electric cook top and a dishwasher. As all the Sports Cabriolet models, the C50 being the third addition to this range will also have an electrically-operated sunroof to take advantage of those glorious summer days. Sliding doors open to the cockpit to add a real indoor outdoor feel to the boat. The cockpit will feature a barbecue and sink as well as outdoor seating. One of the most popular features of the larger previous Sports Cabriolet models has been the garage, and the C50 does not miss here either. At the push of a button, the cockpit sole rises and the transom opens to reveal a garage big enough to house a 3.5 metre RIB with engine and ready to go. This leaves permanent room on the foredeck for the luxurious sun lounge. Power is from a pair of Cummins QSC 600hp or Cats C9 575hp diesels which give an economical cruising speed of 25 knots. Exciting news from the continuous design improvement at Jet-Tern Marine. 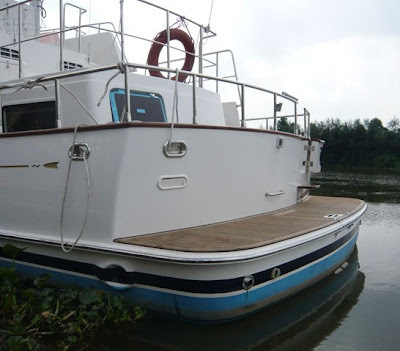 A new cruiser stern has been added on Selene 36 model. Selene-3631 is the second boat fitted with this new stern design with the first one already being delivered to our Russia dealer in the earlier part of 2009. Selene 3631 was tested at a marina nearby Jet Tern Marine’s Dong Guan shipyard. From these water tests the cruiser stern increases the water line length therefore improving the boat trim by locating the additional ballast to the far end. Other benefits include larger wet area storage and better maneuvering at the quarter wave and an overall increase in the boat’s displacement. These subtle improvements will ultimately enhance Selene 36/40’s offshore cruising performance. A larger rudder has also been designed for this new boat providing better tracking course through the water due to the larger wet surface area. The new OM43 is a further development of the successful Oyster LD43, which the renowned British sail yacht builder brought to the market three years ago. While the LD43 had lots of space, Oyster was increasingly aware that some owners wanted the ability to take friends and family on their cruises, which promoted for a new configuration giving more live aboard accommodation, while maintaining the fun appeal and unique style of this boat. By bringing the galley into the upper saloon level, Oyster has created a good-sized second twin or double berth cabin. The saloon features a U-shaped seating area, offering a panoramic outboard vista when seated at the table. Innovative use of the new twin navigator’s seat means there is plenty of space for six people to dine in style. The cockpit offers lots of space for outdoor living with a host of subtle improvements. 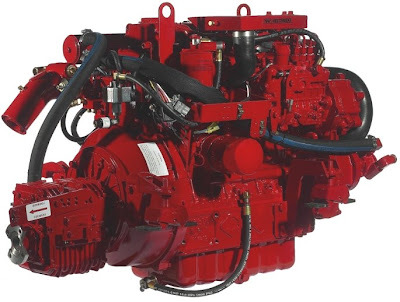 Power is by two new generation fuel efficient Cummins 480hp motors, while most importantly the OM43 retains the two Hamilton waterjets linked to the unique Blue Arrow control system. The pinpoint control achieved with the Hamilton "MouseBoat" provides true single-handed control, making even the tightest marina berth a carefree and simple manoeuvre, whatever the wind and tide are throwing at you. The waterjets means also the OM43 has a draft of just 0.68m with no propellers, so allowing the OM43 to dry out for a beach party and offer shallow water exploring The absence of propellers also means there is extra safety around bathers, and removes the worry of fouling on nets or lines at sea, giving peace of mind for the safety conscious boater. The new Ferretti Custom Line 124 design, created as all the range by architect Giovani Zuccon togather with Ferretti AYT marks renewal in the yard's history. With the design of this new planning flagship Ferretti is broadening its horizons but remaining faithful to its tradition, combining a forward looking philosophy undermining a harmonious blend of elegance, performance, and innovation. The exteriors of the new Custom Line flagship displays sleek and elegant lines typical of this range with extensive large sweep windows and innovative fold down doors creating exclusive terraces above the sea. The new 124 offers generous spaces, with a saloon measuring 50 metres with absence of supports allowing for uninterrupted views. Large windows and natural light is a predominant factor and with the new glazed doors create unity between interior and exterior spaces. Doors looking on the main deck can be fixed or allowed to open depending on the chosen layout. Two standard layouts are available offering different configuration for the saloon living area. The first is two l-shaped sofas with coffee tables, and second is a three settee arrangement in a horse shoe shape with a low table in the centre. Galley is located amidships. Owner area lies forward and includes an office with personal head, sleeping area, and head with double facilities. Four guest cabins are located on the lower deck: two VIP and two twin cabins to fore. The upper deck of the 124 shows the difference from the previous smaller Custom Line's displaying a lounge area up top, providing a scenic saloon exploiting the full beam of the yacht. The flying bridge is an area dedicated to open air relaxation with a deck house forward featuring a large sun pad. There is also another relax area to fore on the main deck with settee, allowing a private area especially in harbours. Power will be from twin MTU 3154 or 3510 units. Sea Ray presents its new baby for its Sport Cruiser line, with the new 230 Sundancer. This is an easy to own and operate boat sleeping four people in a fore convertible vee berth and mid-stateroom. It also features a social exterior cockpit layout with a cleverly designed portside lounger that doubles as a conversation area, with the help also of the retractable helm chair. The 230 will replace the 240 Sundancer, which has sold a remarkable 734 units during its production life. 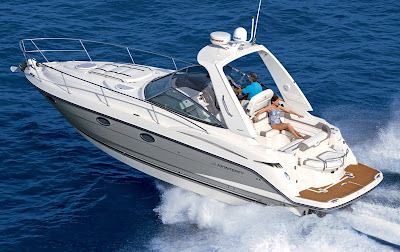 The 230 Sundancer comes out with a standard MerCruiser 5.0 MPI 260hp gas petrol engine propelled with Bravo I sterndrive. Further engines up to 320hp for petrol gas are available, and surprising its competition a diesel power option is available this time going to a Japanese Yanmar 220hp. Bavaria introduces the 28 Sport project, a new entry level addition set to be launched in September 2009. This new entry level Sport Cruiser from Bavaria will be second motor boat which comes from the BMW DesignworksUSA collaboration, a subsidiary of the BMW Group, as seen for the new 46 Deep Blue launched in January 2009. It is standard here to see more of the clear lines and innovative design as seen for the new Bavaria motor boat flagship, and while it shows similarities with the Deep Blue the new 28 Sport will not be as aggressive looking as the bigger sister, but more of a hybrid design between this and the other models of the range. The 28 Sport wants also to be an all-rounder offering a sportive outside and inside associated with a family cruiser. The exterior cockpit deck will feature a sun lounger aft and seating area for five people to port side of the helm station. Inside the sleeping accommodation is for four people with a separated double mid ship cabin offering generous spaces. A spacious head, galley and a convertible vee berth settee to fore completes the interior accommodation. This new Bavaria 28 Sport will replace the current 27 Sport.